Welcome to Wild and Well! I appreciate you being here. My idea for this blog is to provide content that will help you feel better so you can improve your performance. You don’t have to be a crazy athlete to read this stuff, performance is at the foundation of all our lives: work, relationships, hobbies, etc. If you are looking to improve your energy levels, sleep better, balance your mood, or shed a couple lbs through food and lifestyle techniques, then stay put and spread the word, you’ll find a lot of useful stuff here! There is a lot of conflicting ideas out there, so I hope to provide some clarity on them. Please let me know in the comments what questions you have and what you’d like me to blog about! And since this is my business and my life, I will be providing personal information with stories, experiences, and current undertakings of mine. I love to write, and I love to connect, so I’ll be adding in personal anecdotes every so often. Life is about sharing, so that is what the goal of the blog is, to share. I eat everything (I’m not kidding). I’m not part of any “diet camp.” I don’t feel incredibly strong about any one diet because I believe we should be cycling in and out of them as our lives and seasons change. Change occurs during adaptation, so you’ll hear me talk a lot about variety. It’s a top word of mine. Maybe I should of named my business variety.com. Ah, too late. When I feel I have a sensitivity to a food, I stop eating it. Other than that, I don’t have rules, I don’t count calories, and I don’t restrict myself. If it looks good and I’m hungry, I’ll eat it. My body tells me what it wants, and I do my best to provide. A great perk to eating a whole-food dominated diet? That’s what you end up craving. And cookies/ice cream, but mostly the real deal food from the earth. I didn’t grow up eating healthy, I grew up eating processed foods. The healthy switch came over time, and through some rough patches of following fad diets, major M-F calorie restriction, major Sunday binges, and all the damage that comes with it. Food was all I thought about. Luckily, life kept changing, and so did my diet. I am able to sit here now with gratitude to have learned from it all. I love food in a different way now: I am grateful for it, and I take the time to feel it work its magic. Food for me is appreciation, nourishment, and fuel. I just love to love it. What is Wild and Well? I came up with the name while on a hike, and became super jazzed about it. Wild and Well is a lifestyle that I believe is rooted in each of us. We all have a strong pull to get outside and move our bodies, and we can’t do that unless we are taking good care of our health. Wellness is more than quality food and restful sleep, it’s the quality of your relationships, how you manage stress, your priorities, emotional awareness, nature, and how deep your connection is with yourself. 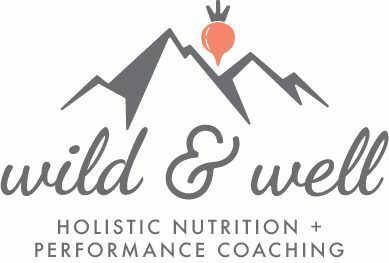 Wild and Well takes a 100% holistic approach to health, meaning: I take a look at the whole person, your unique mind/body/spirit, and create recommendations that will work for YOU, not for the masses. Food is at the foundation of my philosophy, but even if you’re eating the highest quality foods…if you aren’t sleeping, are chronically stressed, and are burying your emotions over and over and over again, you’re not going to feel better, you are not going to break through the plateau. Everything is connected, everything is important, everything matters. One step at a time. What got me interested in Holistic Wellness? In short, the unfailing desire for self-improvement. I started listening to health and wellness podcasts and reading all the books…it filled up all my free-time, I loved it, I couldn’t stop. I love learning about diet and lifestyle strategies that could help me run longer and recover faster. My interests continue to mold and swerve, which is why I love this field so much (I thrive on change). I started experimenting over 5 years ago and my curiosity (another top word of mine) remains unwavered, I will be a student forever. Nutritional Science is a baby. A lot has been uncovered in recent years, but there is still so much we don’t know for sure, the body is just too complex. It is incredibly exciting, but the information can get very conflicting. Part of what I hope to do with this blog is to provide simplified answers to a lot of “health myths” out there. My favorite activities right now are, deep breath –> trail running, hiking, cycling, climbing mountains, exploring my new home playground in Montana, reading, writing, connecting with friends, and happy hour. I am passionate about moving outside in nature as much as possible, and living an active lifestyle instead of scheduling gym sessions. My greatest athletic feat was hiking for 5 months from Mexico to Canada, along the Pacific Crest Trail. I played around a lot with endurance nutrition out there in the wilderness, and have been known to always have collagen, nutritional yeast, tea tree oil, and an avocado on me. I learned a lot that summer about what it takes to play hard while keeping your mind, mood, and body all in balance. That summer you would think I was focused on calories calories calories, but I wasn’t. My focus was on nutrients, sleep, and mindfulness. On average I carried half the food most thru-hikers did, learning a ton about myself and what my body ran best on. It was a 5-month self-investment, and I’d do it again in a heartbeat. Being that the last decade of my life has been mostly endurance-dominated, I have struggled a lot with symptoms of adrenal exhaustion, low iron, low thyroid, and amenorrhea. Things like night sweats, cold extremities, dry and brittle hair/skin, frequent urination, menstrual absence, trouble falling asleep, and waking up not feeling rested despite sleeping 8+ hours. I am still working through some of these, and have seen a lot of great success with the incorporation of certain foods and lifestyle twerks. Chronic cardio is really tough on our Nervous System, which is really unfortunate because as you know, it’s so hard to cut back on (identity, reliance, mood, endorphins, exploration, beauty, community, circulation, etc.). I have both cut-down and improved my relationship with exercise as of late. I now use a variety of activities (some low impact, some high) to get the benefits of exercise, as well as incorporating on and off-seasons to give my body the recovery time it needs. I have gotten to the point where if my running route doesn’t excite me, then I won’t put on my sneakers. Getting to that point took a lot of years, and a lot of education of what was going on with my hormones. Getting to this point has been incredibly freeing, and I’ll never coach someone into doing something they don’t like doing. I want to see you out there for all the benefits and for all the beauty. When we force ourselves into activities and diets we hate, it does a lot of damage, both short and long-term. My hope is to provide content that helps people feel better. That helps people find fulfilment. That helps people help themselves. When we feel good, we are kinder. I’ve met so many kind people in this world, but we can always use more! There is no one size fits all diet, no uniform superfood, no weight loss miracle shake. What works for me, may not work for you. It’s about trying new things, challenging yourself, and paying attention. Reconnecting with our bodies and its cues is such a fun and impactful experience. Team up with your body, work together, become one again, and figure it out. Oh, and let me know when you have an “aha” moment along the way. Those are my fave. I am 64 and always looking to better myself. I am over all in good health but have had some major surgeries over the last 4 year’s. Total knee replacement and diagnosed with prostate cancer, I decided on surgical removal and for 3 years cancer free. So wellness is important to me. I am looking forward to Wild and Well..
Glad to hear it coach lee! So happy to hear you’re cancer free, keep up the strong work and hopefully you’ll find some tips on here to stay in good health!